Family barbecues, Fourth of July parties, picnics, camping, vacations--what do all of these things have in common? Well, food of course! Food is certainly something that we all enjoy throughout the summer, but we often forget about the safety of our food. In the heat of the summer, food tends to go bad faster, so it is important to follow proper food safety guidelines when packing, transporting, storing and cooking our food! Check out some tips below to keep you and your family safe no matter what occasion you are celebrating this summer! Coolers should contain ice or frozen ice packs in order to keep food as cold as possible. Coolers need to be kept at 40ºF or below. Place coolers in a shady location and limit the times they are open. This will help keep the cooler chilled longer. Pack beverages in a separate cooler from the food this way the food cooler doesn’t get opened and closed multiple times due to taking out beverages. Frozen meat can be packed while still frozen and it will stay colder longer. Avoid cross-contamination and keep raw meat away from salads, fruits, vegetables, and dairy products that also need to be chilled in the cooler. Cook food thoroughly. Listed below are the proper temperatures meat should be cooked to in order to be considered safe for eating. It is important to always have a thermometer around to test the temperature as you can’t always tell if food is cooked thoroughly by looking at it. Avoid reusing platters and utensils that previously held raw meat. The temperature danger zone is 40ºF to 140ºF. The key is to never let food remain in the temperature danger zone for more than 2 hours or 1 hour if the outdoor temperature is above 90ºF. Keep cold foods directly on ice or in a shallow container set in a pan filled with ice. Make sure to drain off water as ice melts and replace the container with additional ice. Wrap up cooked meat and place in an insulated container until serving this way the food stays hot. 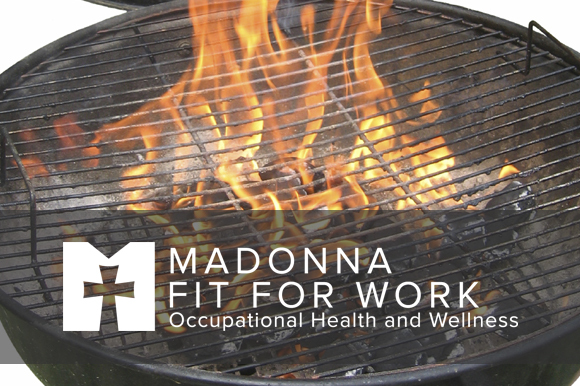 Madonna Fit For Work can provide nutrition education with a registered dietitian to help your workforce eat healthier and manage weight. To learn more, call 402.420.0002 or contact us.